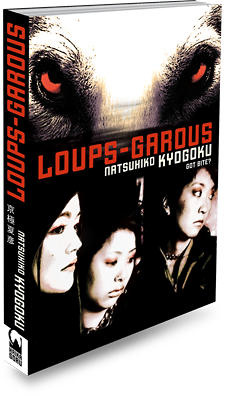 ﻿ LOUPS-GAROUS « Haikasoru: Space Opera. Dark Fantasy. Hard Science. In the near future, humans will communicate almost exclusively through online networks— face-to-face meetings are rare and the surveillance state nearly all-powerful. So when a serial killer starts slaughtering junior high students, the crackdown is harsh. The killer's latest victim turns out to have been in contact with three young girls: Mio Tsuzuki, a certified prodigy; Hazuki Makino, a quiet but opinionated classmate; and Ayumi Kono, her best friend. And as the girls get caught up in trying to find the killer—who might just be a werewolf—Hazuki learns that there is much more [to their monitored communications] than meets the eye. Born in Otaru, Hokkaido. Studied at Kuwasawa Design School. After working at advertising agencies, he established his own design studio. He still works as art director, designer, and bookbinder for various projects. He is also an expert in yokai (Japanese folklore of monsters and ghosts). “It’s the North-South Line,” Ayumi said nonchalantly. “It’s bright,” Mio said, and she lowered her binoculars. Mio shrugged, bored, and approached Ayumi, holding the piercing between her fingertips and bringing it up near Ayumi’s cheek. She wasn’t sure what it was reflecting—Hazuki thought maybe the moonlight—but for a moment, the pink stone glittered. Ayumi moved only the pupils of her large eyes over to where the object reflected light. “What about this?” she said. Mio leaned in toward Ayumi. Ayumi suddenly dropped her shoulders as if they lost all strength, and crossed her arms. She compared facial expressions on Hazuki and Mio. “It’s fun,” Mio said as she walked around Ayumi. What does fun feel like? Hazuki wondered. But before she could answer her question, Ayumi plucked the piercing from Mio. “This thing.” Ayumi stared into it. “I wouldn’t be caught dead wearing that,” Mio said. “Then we’ll just have to put it on you after you’ve died,” Ayumi said. Yuko Yabe… soaked by the rain, pale skin. Pink pupils. It matches her pink contacts, Hazuki thought. Her house was far from hers? But that day… Yuko Yabe was in Section C, where Mio lived. Moreover, that girl with the drenched pink hair was the one who told Ayumi and Hazuki exactly which building Mio lived in. What was that all about? Was that some kind of mistake? Could have been a mistake, Hazuki thought. Just because they’d seen and heard her didn’t make it a reality. “It’s my fault.” Ayumi said unexpectedly. “Liar?” Ayumi made a puzzled look. Ayumi didn’t meet with people. Ayumi hated being looked at directly. Ayumi would never exchange words directly with someone. Ayumi had never even made eye contact with Hazuki.